In short, though I had a rocky start to this book, it turned out to be THE BEST THING EVER! My heart is currently aching for the beautiful, dark souls of Iseult and Aeduan because they are my new OTP and I LOVE THEM TO THE VOID AND BACK. I’m SO EXCITED that the third book is called Bloodwitch because that just means that Aeudan will still be in it and also, did I mention HOW MUCH I LOVE THESE TWO? b) It was two weeks later and well, EVERYTHING HAD CHANGED. 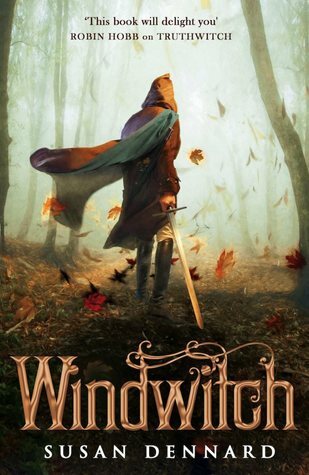 Going into Windwitch right after Truthwitch felt… different. 1. ISEULT AND AEUDAN: Everytime I saw their names on the pages I did a tiny happy dance because Windwitch told the story from BOTH their perspectives and it was FREAKING ADORABLE. AND BRUTAL. AND AMAZING. I loved how they saw each other, how the fact the Aeduan had no threads freaked out a generally stoic witch and the fact that Iseult had no blood scent got to Aeduan. I LOVED READING about how they saw each other, and how they dealt with the feelings of wrongness when they were apart. IT WAS F**KING BEAUTIFUL. Truth be told, THERE WAS NOT A SINGLE TRADITIONAL ROMANTIC THING THAT HAPPENED BETWEEN THEM, but HOLY GOD Susan Dennard made me fall for them anyway. 2. The Storyline: The Story went SO MUCH DEEPER in this instalment, showing you more secondary characters, most inevitable betrayals, more DARK/ VOID MAGIC and well, I LOVED IT. Even though Safi and Iseult and Merik and Safi remained separated through the book, there wasn’t pining of the dreadful sort and that was definitely a plus point too. 4. AEDUAN: HE. IS. FREAKING. AWESOME. AND RUTHLESS. AND POWERFUL. AND CARING. AND HE RESCUED A GIRL FROM PIRATES. AND HE HAS A TORTURED PAST. And he was easily my favourite part of the book. I couldn’t shake the feeling that it had missed something more than the time – that it was a very abrupt beginning and I didn’t know what to do with it. For a while. So for about the first third of the book, the ONLY SCENES I was looking forward to were those that contained my lovely Iseult and Aeduan. Merik felt like he was LITERLLY stomping around the place, claiming he was a forgotten God and DID NOTHING. Although I did like Safi and him in book one, I really didn’t like what his character did in this ENTIRE book – which was NOTHING. It did take me a while to get into this book, and I put it down for a while to read Frostblood, but when I picked it back it, I FELL IN LOVE. A dark, BEAUTIFUL, POWERFUL Fantasy with characters that make you feel all wrapped up in one of my favourite fantasies since A Court Of Mist and Fury. 4.5 stars. HAVE YOU READ ANY SUSAN DENNARD BOOKS YET? Have you had the chance to dive into this series yet? Who is your favourite character? Your strongest ship? WHAT DID YOU THINK? Leave me your links and I'll definitely hop on over to your lovely blogs.